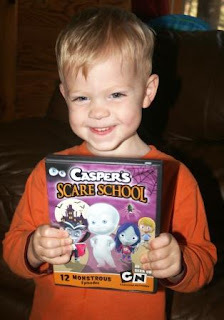 Two Bears Farm and the Three Cubs: Casper's Scare School DVD Giveaway - 2 Winners! Casper's Scare School DVD Giveaway - 2 Winners! During the month of October, we love to pull out our stash of spooky dvds to watch in anticipation of Halloween. Casper's Scare School is a new addition to our collection, and a fun one at that. A very cute and friendly Casper the ghost is sent to Scare School by his uncles, all because he befriended a human boy. At Scare School, Casper will be companions with werewolves, zombies, vampires, ghouls, and other monsters, as they sharpen their scare tactics. You know what I liked most about this dvd? Even though it's about Scare School, it isn't really scary. Reid is especially sensitive to "scary" scenes in movies (scenes that you wouldn't think were scary at all - after all, I only let them watch kid shows). But he didn't feel scared at all while watching these shows. I think the characters are just too cute to be scary. Casper's Scare School includes 12 monstrous episodes with a running time of 132 minutes. You may have seen some of them on the Cartoon Network before. The second season is currently airing - so even if you don't win this dvd you can check out season two on tv! Want a chance to win a copy? Be sure to enter for a chance to win through my Rafflecopter giveaway - there will be two winners! Awwww, lucky kidling (s) who'll get to watch this! I love casper! How fun! How cute. I let my three year old watch this show so I can attest to the fact that it isn't scary. I have always loved Casper! He goes way way back. :-) That picture of Reid is adorable. What a cutie! I've always loved Casper too. What a sweet photo! I'm glad the boys enjoyed the DVD. I remember Casper from way back. We don't have cable, but my daughter likes to watch Looney Toons! My boys like How to Train Your Dragon the movie and the show. We've watched a few episodes online. Casper is great! Also love tom and jerry! Thanks! Scooby Doo is still a favorite in this family. I'm not a big Cartoon person but my kids like to watch Johnny Test and Dexters Laboratory! Casper the Ghost is so fun.. I used to watch it when I was little.. He must be really old.. ha ha.. I would actually like to watch the casper movies with my niece! I don't have cable but we would enjoy watching the Looney Tunes and Scooby. I like The Garfield Show. kristiedonelson(at)gmail(dot)com Thank you. I'd like to see Move it Movements. We are fans of the classic cartoons like Looney Tunes! I would like to see The Garfield Show, I had no idea Garfield was still made! suebunting1977at(gmail)dot(com) I love Looney Tunes! Have you picked the winners for this yet? I've had the page saved and will delete it if needed.